The Liberty Bell Special train set celebrates our cherished Liberty Bell's historic train travels. The Bell's first rail trip in 1885 was to New Orleans for the World's Industrial Cotton Exposition while one of its last trips was to the 1915 Panama-Pacific Exposition in San Francisco. Specially modified Pennsylvania Railroad flatcars were used to carry the 2,080-pound Bell in its wide-ranging travels. The visits to nearly 400 cities and towns over a 32-year span drew huge cheering crowds and special celebrations that often included music, parades, and military salutes. We are proud to present the Liberty Bell Special, and through railroading, let you share in the Bell's rich history. Retail $213.88 SAVE 13% ! "Great Set For The Kids"
We got this set to add to our annual Christmas Train Layout. The grandkids live in Philly so they really enjoy the Liberty Bell in the set! The track goes down and comes up easily. This is great because we take the layout up and down each year. All the wiring is done with push-in connectors and jacks so they are very easy to set up. The accessory portion easily handles all the lights on our set. We were very pleased with it. We added a bobber caboose and next year may even get a different train set to add to the layout. 2-6-0 locomotive and tender with operating headlight. 1860-1880 coach "Boston" _ Flat car with Liberty Bell and Flags. "The Liberty Bell has a ring to it!" 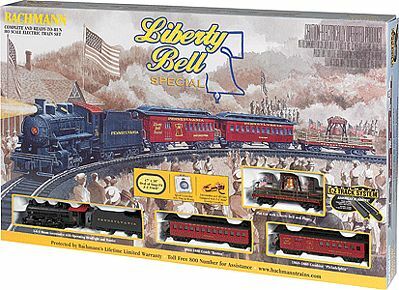 We love this Bachman Liberty Bell train! We set up dad&apos;s trains for special events at his assisted living facility (that&apos;s him in the photo provided) and we showcase the Liberty Bell train for patriotic holidays such as Memorial day, July 4, and we will also run it on Veteran&apos;s Day. The flags and Liberty Bell are so detailed, it looks GREAT! And it was a VERY big hit with the other residents of the facility. I help dad set up each time, and the Bachmann EZ track makes it fast and easy. I am very pleased with this train set. The engine, tender, and two coach cars work great. They run over 18 curve switches with no problems. The Liberty bell flat car has given me some problems. I purchased three additional coach cars and the engine has no problems pulling a series of 5 coach cars.